Some women thrive and breeze through the pregnancy as though they had done it one hundred times before. Others struggle as their body changes shape to accommodate this new growing person. Pregnancy is a long journey and women must honour and nurture their body, both before and after birth. Pregnancy Yoga and Postnatal Yoga are the classes to do in order to look after your body, prepare you for the birth and build your strength post birth. There are so many benefits to both Pregnancy Yoga and Postnatal Yoga, such as to improve sleep, reduce stress and anxiety, increase the strength, flexibility and endurance of muscles needed for childbirth. Post-labour the benefits include improving posture, repairing the body with pelvic floor building strength postures and to rebuild flexibility. 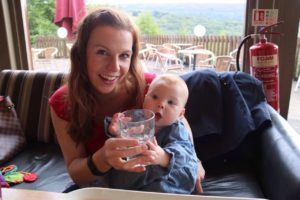 We spoke to two of our Yoga Kula students Lyndsey and Lucy who both attended Yoga Kula’s Pregnancy Yoga and Postnatal classes to find out more about their pregnancy yoga journey. Why did you choose to do pregnancy yoga and postnatal at Yoga Kula? Lyndsey: I chose to do pregnancy yoga primarily to learn breathing techniques to utilise whilst in labour, but also to relax and release tension throughout my body as my pregnancy progressed. Postnatal yoga was really helpful to get my body moving again and to meet other Mummies. Lucy: I wanted to be as mobile as possible throughout my pregnancy. The idea of doing Pregnancy Yoga was to take an hour out of each week to help me focus on me and the baby. I hoped that Pregnancy Yoga would help with flexibility and breathing. Did you find the Pregnancy Yoga classes helpful during your pregnancy and labour? Lyndsey: Absolutely, by attending the Pregnancy Yoga classes I learnt relaxation techniques and practiced them weekly whilst pregnant. I always felt relaxed and energised after class and did the breathing throughout my labour to help focus my mind and relax during my contractions (surges). Lucy: I found the Pregnancy Yoga classes very helpful in giving me time during a busy working week to focus on my baby. It was ‘time out’ to remember what an amazing thing my body was doing. The most helpful aspect of the classes was learning about breathing techniques – the class reminded me to breathe. Such a silly idea but I realised I had been rushing around and not really breathing deeply and with intention. I took this thought with me into labour. Each breath I tried to focus on what my body was doing and what the baby was telling me. What was your favourite part of the Pregnancy Yoga and Postnatal Yoga classes? 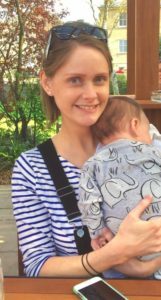 Lyndsey: The Pregnancy Yoga classes were great for stretching out, bonding with the baby, relaxation, learning birthing positions and meeting other mums. And similarly, Postnatal Yoga classes are fantastic for moving slowly and carefully again after birth, relaxing (when the baby is quiet) and meeting other mums. Lucy: During Pregnancy Yoga I enjoyed being pushed more than I thought I could be. 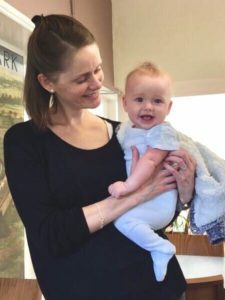 I had put myself into cotton wool, especially towards the end of the pregnancy, but Lara encouraged me to really stretch and move and afterward I felt so much better, like I had done a real work out. Did you do any other classes during your pregnancy? Lyndsey: Yes, I carried on with a Restorative Yoga practice, which was just heavenly whilst I was pregnant. It was a very relaxing class with lots of props to enable me to get comfortable and relax with my bump. Catharine and Lara both also recommended Yoga Nidra, which I managed to do 3-4 times a week in addition to 1-2 pregnancy classes. I also did the Birth Preparation workshop, which is coming up again in December. This was such a fantastic workshop to do and my partner was also able to attend. Lucy: I did swimming and pre-natal Pilates, but stuck to Pregnancy yoga. Would you recommend the Yoga Kula classes to other Mummies? Lyndsey: Yes, Pregnancy Yoga is a must. The Yoga Kula Pregnancy Yoga classes were by far the best pre-natal class I did and the best labour preparation out these. Postnatal was amazing because like with Pregnancy Yoga classes you focus on the pelvic floor and building strength in your body again. If other Mummies have the time to get to both classes before and after birth, then the results will certainly show. Lucy: Definitely. Pregnancy Yoga was a time in the week for me and my baby to spend some time together. I enjoyed the time to focus positive energy towards the baby. It was such a relaxed class where you would chat before the class with whoever was sitting next to you. Lara was informed and helped me to get ready for the birth by channeling my thoughts towards the amazing thing that my body was going to do. Postnatal is the same, everyone is in the same situation so you can relate to everyone in the room. Yoga Kula run two classes per week; Tuesday at 6:30pm and Saturday at 12:30pm. Postnatal classes also run every Monday at 11:30am and Friday at 2pm. Lara and Catharine both run the pregnancy classes. Catharine and Sian run the Postnatal classes. Our next Birth Preparation workshop takes place on 25th November 2017. Once you have finished the Pregnancy Yoga classes and you have had your baby, we would like to give you the opportunity to try your first Postnatal yoga class for free. All you need to do is email us to let us know you have had the baby and we will add a free class to your Yoga Kula Mind Body account.